Mrs. A. is a woman, age 80, who presented to the memory clinic for concerns of forgetfulness. Although her memory loss had slowly progressed over the past 2 years and her symptoms did not affect function, her children had noticed her forgetfulness and encouraged her to be evaluated. She lives independently since getting divorced over 40 years ago. She manages her own finances, her home, and cooking. Mrs. A. drives, although her family admits to being nervous riding with her. There have been no noticeable changes in her basic activities of daily living. She is social and active in a book club, although her daughter states she is not as active as she once was. Mrs. A.’s medical history is significant for thyroid disease, cataract surgery, prolapsed bladder, and uterine prolapse treated with a pessary. She was first evaluated by her primary care provider for cognitive complaints and placed on donepezil for symptomatic treatment 1 month before presentation. She had MRI findings of dural enhancement overlying the cerebral and cerebellar convexity with sagging of the brainstem and a 2-mm anterior communicating aneurysm (ACA). These findings were reevaluated by computed tomography angiogram (CTA) of the head, confirming the 2-mm superior projecting ACA. When asked, the patient admitted to a sensation on the left side of her head, which she did not feel was painful nor problematic. She had no history of chronic headaches or other symptoms suggestive of subarachnoid hemorrhage. 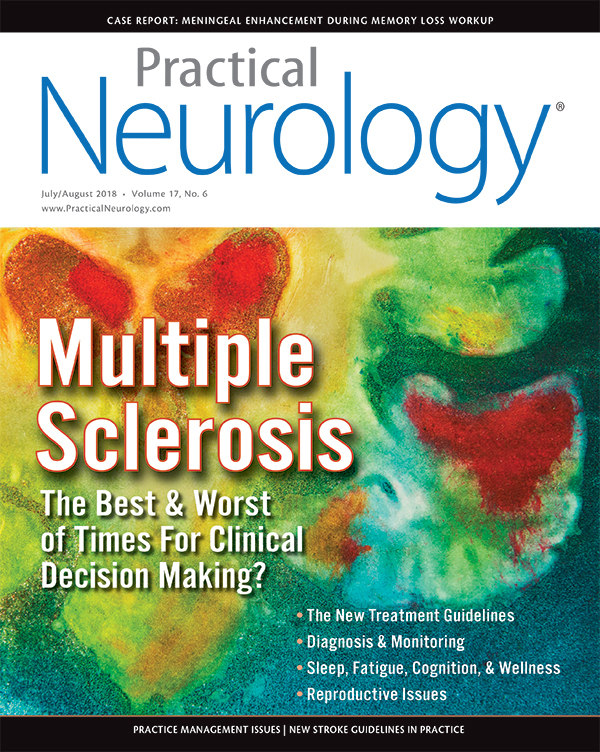 When Mrs. A. presented at the memory clinic, her initial Mini-Mental Status Exam (MMSE) score was 28 of 30, and there were no findings on her neurologic exam. Blood tests were recommended and ordered for a complete metabolic panel, complete blood count, fluorescent treponemal antibody absorption, antinuclear antibodies, sedimentation rate, prothrombin and partial prothrombin times, thyroid stimulating hormone (TSH), free thyroxine (FT4), vitamin B12, folate, vitamin D, and homocysteine. Except for elevated TSH of 6.71 mIU per L and FT4 of 1.1 ng per dL, all findings were negative. A repeat brain MRI, with and without contrast still showed diffuse dural and pachymeningeal thickening and enhancement throughout the supratentorial compartments (Figure). Based on the MRI findings with the differential to include pachymeningities, the decision was made to move forward with a lumbar puncture (LP) for cerebral spinal fluid (CSF) analysis and opening pressures. Difficulty was reported in obtaining CSF, and table tilting was required to collect enough fluid for testing. Mrs. A.’s opening pressure was 6 cm. She tolerated the procedure well and had no neurological complaints after the procedure. The analysis of CSF was negative for infectious, inflammatory, and neoplastic processes. The angiotensin-converting enzyme (ACE) level was slightly elevated with unknown significance. Serum ACE was normal. Based on the development of marked memory loss and subtle withdrawal from her hobbies, her CSF was also analyzed for AD biomarkers with findings of amyloid-β (Aβ)-42 of 341 pg per mL, phosphorylated tau 180.2 pg per mL with an Aβ to tau index (ATI) of 0.5, consistent with probable AD. Figure. MRI imaging study with contrast. The axial image shows dural-pachymeningeal thickening and diffuse enhancement (A). The coronal image shows continued dural-pachymeningeal thickening and diffuse enhancement (B). The sagittal image shows noncontrasted view with typical age-related atrophy (C). The fluid attenuated inversion recovery (FLAIR) axial image shows scattered gliosis in the periventricular area probably representing chronic white matter disease bilaterally (D). The patient remained clinically stable, and repeat imaging was requested and performed 2.5 months after the initial MRI; the dural and pachymeningeal thickening was no longer present, and ventricle size was normal. Because of the low pressure seen on LP, with no obvious source of a leak, a spinal axis MRI and ENT evaluation were performed, but yielded no findings. Mrs. A. had a follow-up clinical evaluation 5 months after the final brain MRI. This evaluation confirmed continued clinical stability with symptoms of mild memory loss and no complaints of headaches or physical symptoms. She remains on symptomatic treatment for her initial complaint of memory decline secondary to probable AD. AD is a fatal, degenerative, and progressive brain disease that is the leading cause of dementia in the US, affecting an estimated 5.7 million people.1 The 2 pathologic hallmarks of AD are Aβ and hyperphosphorylated tau that may contribute to an inflammatory cascade in the brain that causes disease progression. Current treatment is symptomatic relief with no known disease-modifying treatment or cure available at the present time. AD may provide the link between inflammation and neurological disease,2 and we report here an a case of a white woman, age 80, with diffuse dural and pachymeningeal enhancement found incidentally on MRI during her workup for memory decline. An extensive literature search did not find another published case or discussion of intracranial hypotension and cognitive decline in which AD biomarkers were also found. This case documents these findings in an otherwise healthy patient. Treatment is usually conservative management of bedrest, fluids, and caffeine, although if the condition persists, it may be necessary to identify the leak location and treat it with a lumbar epidural blood patch. Intracranial hypotension usually resolves within weeks to months. Idiopathic hypertrophic pachymeningitis (IHP) is a rare inflammatory condition that results in localized or diffuse thickening of the dura mater and may be primary, with no identified cause, or secondary, which is associated with many identifiable causes, usually infectious or inflammatory (eg, neurosyphilis,9 bacterial meningitis,10 Wegener’s granulomatosis,9,11,12 or polyarteritis nodosa). Hypertrophic pachymeningitis can involve the cranial dura mater and the spinal dura mater, most often the cervical and upper thoracic segments. Mrs. A’s initial work up for cognitive concerns showed MRI findings suggesting diffuse patchy meningeal thickening and enhancement, raising suspicion of an inflammatory condition such as IHP. After a repeat MRI, done1 month later, confirmed the findings, LP and CSF evaluation were performed. Secondary IHP was excluded from the differential because of both the low opening pressure and negative CSF results. Mrs. A did not complain of orthostatic headache, the most classic symptoms of intracranial hypotension. Diagnosis of intracranial hypotension was made with no source for CSF leak documented. Subsequently, the initial MRI findings of diffuse enhancement resolved spontaneously. This case supports the need to routinely check opening pressures at LP despite the absence of clinical symptoms. 1. Alzheimer’s Association. 2018 Alzheimer’s Disease Facts and Figures. Alzheimers Dement 2018;14(3):367-429. 2. Cooper EL, Ma MJ. Alzheimer Disease: clues from traditional and complementary medicine. J Tradit Complement Med. 2017;7(4):380-385. 3. Rabin BM, Roychowdhury S, Meyer JR, et al. Spontaneous intracranial hypotension: spinal MR findings. Am J Neuroradiol. 1998;19(6):1034-1039. 4. Miyazawa K, Shiga Y, Hasegawa T, et al. CSF hypovolemia vs intracranial hypotension in “spontaneous intracranial hypotension syndrome.”.Neurology. 2003;60(6):941-947. 5. Mokri B. Spontaneous low pressure, low CSF volume headaches: spontaneous CSF leaks. Headache. 2013;53(7):1034-1053. 6. Schievink WI. Spontaneous spinal cerebrospinal fluid leaks. Cephalalgia. 2008;28(12):1345-1356. 7. Schievink WI, Maya MM, Louy C, Moser FG, Tourje J. Diagnostic criteria for spontaneous spinal CSF leaks and intracranial hypotension. Am J Neuroradiol. 2008;29(5):853-856. 8. Schick U, Musahl C, Papke K. Diagnostics and treatment of spontaneous intracranial hypotension. Minim Invasive Neurosurg. 2010;53(1):15-20. 9. Kupersmith MJ, Martin V, Heller G, Shah A, Mitnick HJ. Idiopathic hypertrophic pachymeningitis. Neurology. 2004;62(5):686-694. 10. Ueno T, Hikichi H, Kon T, Nunomura JI, Tomiyama M. Bacterial meningitis due to Streptococcus pneumoniae following untreated idiopathic hypertrophic pachymeningitis. J Neurol Sci. 2017;380:44-45. 11. Jung YH, Lee MJ, Lee C, Cha J, Chung CS. Granulomatosis with polyangiitis-associated hypertrophic pachymeningitis mimicking spontaneous intracranial hypotension: a case report. Headache. 2017;57(3):488-493. 12. Choi HA, Lee MJ, Chung CS. Characteristics of hypertrophic pachymeningitis in patients with granulomatosis with polyangiitis. J Neurol. 2017;264(4):724-732. 13. Mamelak AN, Kelly WM, Davis RL, Rosenblum ML. Idiopathic hypertrophic cranial pachymeningitis. Report of three cases. J Neurosurg. 1993;79(2):270-276. 14. 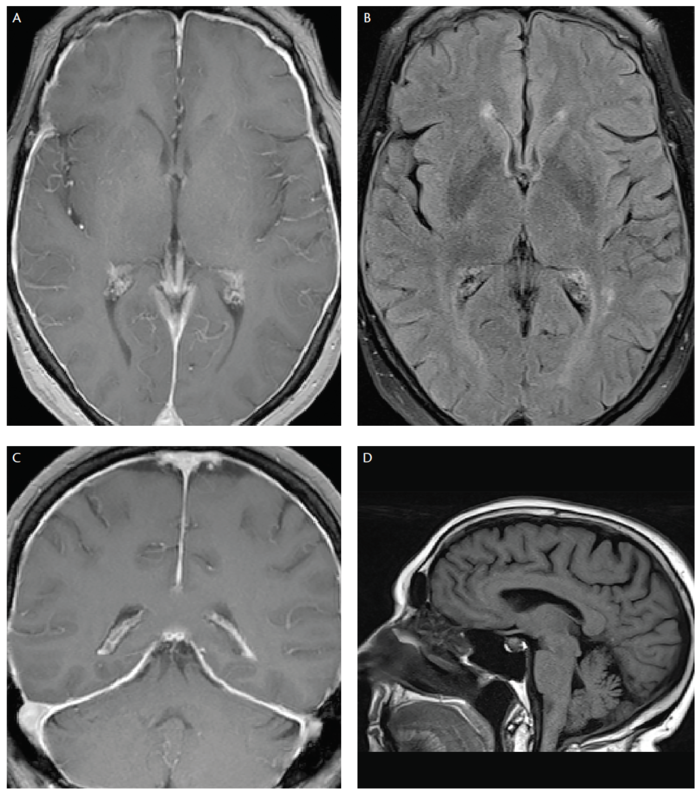 Huang Y, Chen J, Gui L. A case of idiopathic hypertrophic pachymeningitis presenting with chronic headache and multiple cranial nerve palsies: a case report. Medicine (Baltimore). 2017;96(29):e7549. 15. Kuhn J, Harzheim A, Riku S, Muller W, Bewermeyer H. [Hypertrophic cranial pachymeningitis as a rare cause of headache]. Nervenarzt. 2006;77(4):423-429. Dr. Goodman is a member of the Alzheimer’s Disease Advisory Board for Eli Lilly and serves as a key opinion leader for Bioclinica. His coauthors have no financial relationships to disclose.